Which is the best gravity water filter system? Berkey or Doulton? And how good are the AquaCera or Propur gravity fed filters? What about all the cheaper alternatives you can find online? Many will try to convince you, that a system of a certain brand is best for you. But I think, the best water filtration system is one that suits your needs at the lowest possible price. Select the kind of filter elements you would need to clean your water. This depends a lot on your specific water issues. And keep in mind, that there is no need to use filter elements and container from the same brand. Decide if you want a stainless steel or plastic gravity filter system. Choose the right size. See recommendations in the Buyer's guide below. Of cause, buying a gravity water filter system and filter elements from the same manufacturer is the easiest way, but you may pay more for the same clean water. I recommend that you to take the time to get to know your options - and save some money. What do the Black Berkey Filter elements remove? Why spend money on extra fluoride filters? Why choose a gravity fed filtration system? What is the Best Container Material? Stainless steel or plastic? The filter elements - or filter candles - are the heart of a gravity filter. There is a wide choice of filter elements. Do not let the housing manufacturers fool you. Most filter candles come in standard sizes. Hence you can mix and match housing and filter elements from different manufacturers, if you like. You are not bound to use only filter candles of the same brand as the housing. This is important, especially if you live in US states like California, where Berkey housings are not available due to the “no lead law” and Berkeys refusal to take all tests needed to be able to sell there. If lead is your main problem, Black Berkey and Doulton ATC Super Sterasyl Candles seem to be the best option. For fluoride, the Berkey fluoride elements are a good choice. Only keep in mind, they only work in combination with other filter elements. Additionally fluoride reduction relies a lot on the pH of your water. Top of the line are the Black Berkey Purification Elements. They are powerful water purification elements, but expensive. They remove the widest variety of contaminants of all filter candles on this page. The special formula used for the filter candle combines the advantages of activated charcoal and ceramic with those of ion exchange filters. In addition silver is added to give these elements bacteriostatic properties. The nano-technology used for these elements enables them to even filter out food color, while leaving healthy minerals untouched. 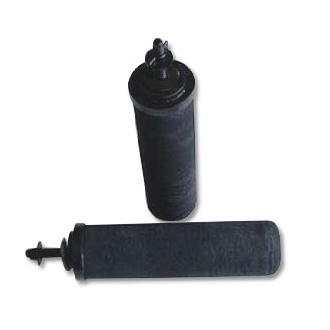 Like other filter elements, the Black Berkey Purification Elements filter out viruses and bacteria, take care of silt, rust, sediment and remove bad taste and odor. They also hold back trihalomethanes, chloramine, chloride, heavy metals like aluminum, cadmium, chromium, lead, mercury, pharmaceutical drugs, pesticides, VOCs or petroleum products. Lab Test results are public. See them here. Berkey does not have NSF certification for these filters, but their claims are backed by State and EPA accredited laboratories, who found that these elements exceed the NSF/ANSI Standard 53. You would install the Black Berkey filter elements in the upper chamber of your gravity filter housing. They are sold in pairs, and one pair purifies approximately 6,000 gallons of water. During this lifespan, you can also clean them whenever the water flows too slow through the filter. Due to the embedded silver bacteria can not grow inside the candle. For even better results, you can combine Black Berkey purification elements with the Berkey PF-2 Fluoride and Arsenic reduction filters. These elements come with a 2-year, pro-rated warranty. One pair filters approx. 6 000 gallons. Currently they are only available in 9” size. Propur tried to develop the best possible filter element for gravity water filters. Consequently they only have one type of element, available in various sizes. Thez also fit into gravity systems by other manufacturers like Berkey or Doulton, if you wonder. Propur gives you a 1-year limited warranty on these elements. What does the Propur ProOne remove? In short, a lot ranging from micro plastic, pharmaceutical drugs, VOCs, heavy metal, fluoride, chlorine to pesticides and more. In case you are curious, the Propur ProOne G2.0 Filter Element was tested by an independent lab with quite impressive results. See them here. Bad news - Berkey no longer sells the Berkey Earth Filtration Elements. But Amazon still has some of the shorter replacement filters. If you need an alternative to the discontinued Berkey Earth filter candles, check out the Doulton alternative. The will fit your Berkey system. The Berkey Earth elements already remove fluoride from the water. So why should you consider buying an extra fluoride filter? All filters that reduce fluoride loose part of that ability over time. After the filter is "full", it can no longer hold back all fluoride. Same is true for the Berkey Earth elements. While they keep working fine for other contaminants, fluoride removal is limited after a few hundred gallons. Adding the exchangeable Berkey PF-4 fluoride filters will extend the filter ability of the other elements to remove fluoride. The Berkey PF-2 fluoride and arsenic reduction elements are an addition to the Black Berkey purification elements. You attach them at the bottom part of your filter housing. It is important to know, that you always need to use the same number of Berkey PF-2 and Black Berkey elements. The material used for the Berkey PF-2 elements is safe, non-leaching Polypropolene #5. The elements are BPA-free and you can get them in pairs. They extent the gravity filter‘s efficiency so it also removes more fluoride plus arsenic V and pre-oxidized arsenic III and other residual heavy metal ions. The filter life of the Berkey PF-2 filter elements is 1000 gallons. The Berkey PF-2 Fluoride and Arsenic Reduction Elements are covered under a six month warranty. The Doulton Sterasyl Ceramic Filter Candles remove bacteria and cysts from water. They consist of diatomaceous earths, backed at a very high temperature of over 1000 C. To protect you from bacteria that could grow inside the filter, silver is also part of the formula. That makes them self sterilizing. This process ensures a high porosity with small pores that can trap bacteria and cycts. Overall, this is a water filter technique already over 170 years old and proven to work. More than 99.99% of bacteria like cholera, typhus, amoebic dysentery, ecoli, colibacillose or bilharzia, and anthrax spores can‘t pass the filter. No cysts can pass through. Additionally the candles hold back particles greater than 0.2 µm like iron, asbestos or dirt. 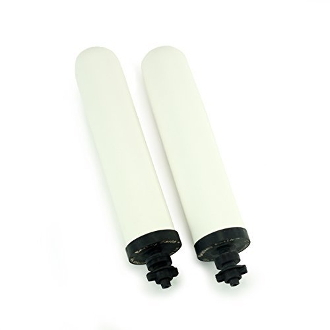 These bacteriostatic filter candles are easy to handle and require very little maintenance. You can clean and reuse them for a long time. Just brush and rinse them from time to time, whenever you have the feeling the water takes longer to pass the filter. The Doulton Sterasyl Ceramic Filter Candles fit British Berkefeld housings as well as Katadyn TRK Ceradyn, NewtonWater, Gravidyn, Artesa, Epic La Natural, Berkey (Big, Imperial, Crown, Light, Blue, etc. 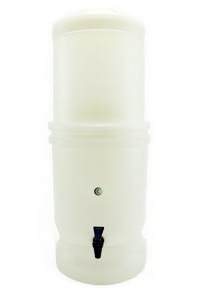 ), CWR Travel water filter and other gravity filter housings. When you buy Doulton replacement filter candles, they come with their own wing nut and gasket. In case you want to store used filter candles, Doulton recommends to air dry them for at least 24 hours. In a dry area they will keep for a while. That makes them a good option temporary use in a cabin or any other place, where you don't live all the time. Most other filter elements might loose some of their abilities to filter water when not used constantly. Removes bacteria, cysts, turbidity and fine particulate matter >0.2 µm. Washable. Very long filter life. The Doulton Supersterasyl Filter Candles are Sterasyl candles with activated carbon on the inside. Do not mistake them for the cheaper Doulton Sterasyl Filter Candles, because these offer only microbiological protection. The Supersterasyl candles can do more. Additionally to the removal of bacteria and cysts, these filter elements remove chlorine, bad taste and odor, pesticides, herbicides and reduce industrial solvents. Contrary to the Doulton Sterasyl filter candles, you can use them only for about six month. Then you need to replace them. The reason is simple: The activated carbon clogs up and sooner or later can no longer bind contaminants. As a consequence, waterborne bacteria and toxic chemicals may stay in your water. Supersterasyl candles removes bacteria, cysts, chlorine, bad taste and odor, pesticides, herbicides, fine particulate matter, turbidity, and reduces industrial solvents. They do not remove lead, though. Two 7" ceramic filter candles can clean 6.5 gallons or 25 liter per day. Two 10" elements are good for 8.5 gallons or 32 liter of cleaned water. They are sold in 7" and 10" length. The Doulton ATC Super Sterasyl filter candles are comparable to the Super Sterasyl ones, with one big difference: They can remove lead from water. Unfortunately, they are only available in 10" length. Filter bacteria, cysts, particles, chlorine, organics and lead. 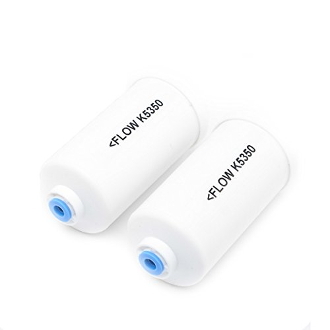 If you are looking for a plastic gravity filter, you have a few options. The Berkey Light System is made from non-BPA/BPS co-polyester. It stores about 2.75 gallons (10.4 liters) in a transparent blue container. You can always see, how much water is left in the chambers. This is a medium size system, suitable for a family. If you like it stylish, there is a stand with LED lights available. You can use it with up to four 9" filter candles. Additionally you may add up to 4 Berkey PF-4 or PF-2 Fluoride and Arsenic Reduction Elements in the lower camber. The Doulton HCA gravity filter system holds 1.33 gallons. The high density polypropylene is lightweight and durable. When set up, the Doulton HCA has a diameter of 7.5" and is 19.75" high. 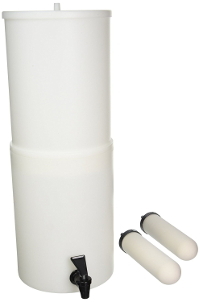 You can fit this gravity filter system with up to two filter candles. If you use the wider Imperial candles, a daily output of 20 gallons is possible. This system is sold with two 7" Super Sterasyl filter candles. Other 7" filter candles, made by Doulton or Berkey, would also fit into the upper chamber. The AquaCera CeraGrav LP5 unfortunately is now discontinued. Aquacera now concentrates on stainless steel gravity systems and no longer sells it. It was a budget alternative to the more expensive Doulton and Berkey plastic gravity filters. Size 18" H x 7.5" D 19.25" H x 8.5" D 23" H x 9.5" D 26" H x 10" D 30" H x 11" D 19.25" H x 8.5" D 18.5" H x 7.5” D 19.5" H x 8.5” D 22.5" H x 9.25" D 25.5" H x 10” D 21 1/2" H x 8 7/8"
Stainless steel gravity filter systems look all quite similar. Not much of a choice design wise. In contrast, their sizes vary widely. Due to compatibility you can just go for the right size for your need. Berkey became a household name for gravity filters, not only for families, but especially within the disaster preparation community. 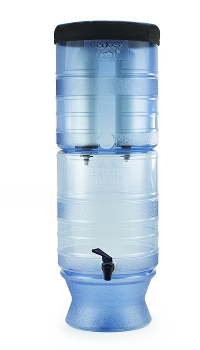 Berkey offers a wide line of gravity filters that suit a diverse group of happy customers. Their filters share all the same great technology, no matter which size your Berkey system is. Their main competitor, the British company Doulton, currently has only two gravity filter systems in their program. If you decide for a Berkey stainless gravity filter, you have a wide choice of sizes, from 1.5 to 6 gallons holding capacity. The smallest Berkey gravity filter has space for just one filter element, while the biggest Berkey container fits up to eight filter candles. For transport or storage, the upper chamber fits into the lower chamber. Contrary to i.e.the Propur system, they only come with a plastic spigot. If you want a steel one, you need to order that as an extra which would set you back around $25. Standard in Berkey gravity filter systems are the so called Black Berkey filter elements. They are their best - and most expensive - filter candles. For California, Iowa and Wisconsin residents: Berkey filter elements fit into the Doulton housing, and vise versa. The Doulton stainless steel gravity filter system just comes in one size. It holds 2.25 gallons and is made of surgical grade polished steel. The Doulton GSS-Mini personal stainless steel filters are discontinued. The upper chamber fits into the lower chamber for transport. Assembled it is 19.25" high with a diameter of 8.5". The Doulton SS2 is usually sold with two 7" Super Sterasyl filter candles with long thread mount. But is would also fit other 7" candles like the Doulton Sterasyl or Doulton ATC Super Sterasyl. 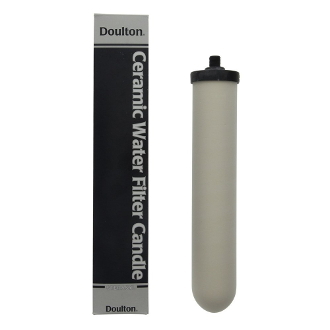 You can add up to four candles to your Doulton stainless steel gravity filter system. If you use it with four Imperial Super Sterasyl filter candles, you could filter up to 40 gallons of water per day. Propur gravity filter systems are available in 4 sizes, suitable to filter water for one to more than 4 people. They are made from 304 stainless steel and every system comes with an anti-slip pad and a stainless steel spigot. These are nice features you would have to pay $25 extra if you buy a Berkey system. While their smallest system contains only one filter element, the Propur King gravity filter fits up to four 9" filter elements. If you need a faster and bigger system, your only choice would be a Berkey system. Stainless steel spigot is included. Biggest system only suitable for 4-5 people. There are many reasons to go for a gravity filter. The small systems are great for camping or hiking, while the bigger home gravity filters are ideal for families that can also double as emergency water filter. Before you buy a gravity fed filter, you should decide which housing material you prefer. There are advantages and disadvantages to both choices. Then you should determine the right size for you. In a third step, select the filter elements. Which ones - and how many elements - you use may change over time. If you use your gravity filter system daily with tap water, cheaper ceramic candles might be enough. For emergencies like flooding, when there is no clean tap water available, you can store more powerful filter elements. Most gravity water purification systems are made from food-grade material, no matter if it is steel or plastic. Your gravity filter will stand where it is most convenient for you. That may be your kitchen or your dining area. I think, the steel gravity housings look better than their plastic counterparts. But that is purely a matter of personal taste. Plastic filtration systems have the advantage, that you can easily see how much water is left in your filter. They are also lighter than the steel models. Additionally, plastic is cheaper than steel. If you go for plastic, look for a BPA-free, food grade filter system. On the downside, plastic breaks easier than steel. If a plastic part falls down, it is more likely to break than a steel one. They might get a dent, but will continue to work just fine. You can take many stainless steel housings apart and store the top inside the bottom part for transport or storage. With most plastic filter systems this would not work. Stainless steel systems are also available in a wider range of sizes. 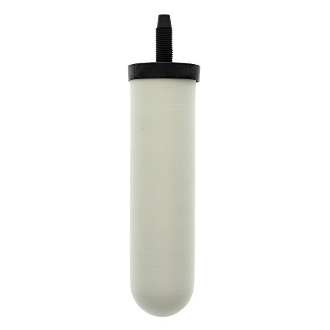 If you decide to buy a steel gravity fed water filter, check it for rust before you use it the first time. The steel should not rust, but I have seen complains about it from owners. The rust was probably caused by a fault during manufacturing and that would definitely be a reason to return a container. Many of the filter systems come at different sizes. So which one is best for you? Most importantly, how many people will use the filtered water. To get an idea, the Center for Disease Control and Prevention (CDC) recommends a minimum of 1 gallon per person and pet per day for disaster preparation. Additionally, it matters if you use the water for drinking only or plan to cook with the clean water also. Or plan to even use is for basic hygiene in case of an emergency. If you think you need more water than the average person per day, take this into account as well. Pregnant women, sick persons or everyone living in a hot climate would need more than just one gallon per day. How much space do you have in the area where you use it? Do you want a filter for sustained or emergency use? Convenience: The larger the housing, the less often you will need to fill it. I would always buy a gravity filtration system that is one size bigger than what I actually need at the moment. They are expensive enough, so I would not want to buy another one just because our family got bigger. Plus, I can easily increase the flow rate by adding more elements whenever I need to. By now you have all the necessary information to choose the best gravity water filter system for your needs. If your budgets permits, go for a stainless steel housing from Berkey or Doulton and equip it with filtration elements that fit your water issues. For emergency use, I would combine it with the Black Berkey purification elements and add fluoride filters as well to get rid of heavy metals that might lurk in the water. For every day use, the Doulton SuperSterasyl candles would work for most tap water related problems. Only if lead is a problem, I would choose the Doulton ATC Super Sterasyl filter elements instead.